Earlier this year, the NYPD adopted a policy to stop using the term “accident” to describe traffic collisions. The San Francisco police department made similar changes a few months later. The problem with the term “accident,” of course, is that it implies no one was at fault — that traffic injuries and deaths are just random, unpreventable occurrences. It’s part of a cultural permissiveness toward dangerous driving, which in turn contributes to the loss of life. News media, however, have been slower than police to acknowledge the shortcomings of the term “accident.” While even NYC Police Commissioner Ray Kelly, notorious for turning a blind eye to traffic violence, issued a statement that “the term ‘accident’ has sometimes given the inaccurate impression or connotation that there is no fault or liability associated with a specific event,” major press outlets like the New York Times and the Cleveland Plain Dealer still tend to use “accident” as the default term for car crashes, even in vehicular homicide cases. One journalism institution could change that. The Associated Press produces the preeminent style guide for journalists, a reference used by news outlets around the country and around the world. While the AP has acknowledged the inherent problems with the term “accident,” it has yet to issue clear guidelines for journalists that would prevent the imprecise term from tacitly excusing thousands of deaths every year. Minthorn responds: “Yes, avoid terms that might suggest a conclusion.” So there you have it, right? Not quite. Words matter, and the way car crashes are framed has a powerful effect on how they are perceived. If thousands of preventable traffic injuries and deaths per year are described as accidental, why support thorough investigations to uncover causal factors and determine potential solutions? The Associated Press updates its style guide annually to reflect evolving cultural norms. For example, in 2008 the AP revised the guide to recommend the term “gay” as opposed to “homosexual,” following a campaign by advocates for LGBT rights. These adjustments recognize the importance of language in making sense of our world. Adding an entry in the Associated Press Style Guide that clearly positions “collision” as the preferred term, instead of “accident,” would shape perceptions of traffic violence and, over time, make American streets safer. Agree. And the story about how a poor rich boy escapes responsibility (what a surprise) is mind blowing. It’s time to nix the term accident, collision or crash in association with hit and run. Hit and run is a crime that occurs after a collision. 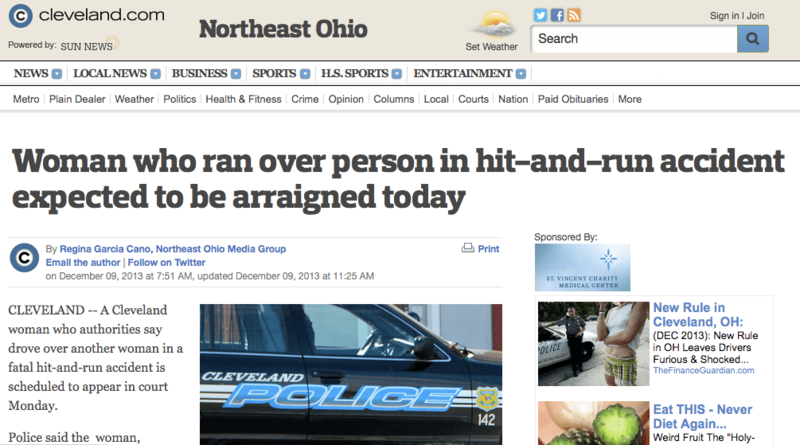 It is causing a lot of confusion out there… “woman who ran over person in hit and run crime to be arraigned today” would seem more appropriate. I think you are a little confused here, Angie. The word “accident” does not imply that there was no liability for the collision. It only indicates that the collision was not caused deliberately. The word “Accident” is the opposite of “Deliberate”, not a synonym for “Blameless”. So an incident of vehicular homicide or road rage would not be called an accident. But a case where a driver was temporarily incapacitated, say by the sun or a violent sneeze or a brake failure, would still be regarded as accidental. And the use of the word “accident” there in no way precludes a civil liability being established nor an insurance claim being successfully made. “hit and run crime” is redundant. You wouldn’t say “Wesley Snipes indicted for tax evasion crime,” I don’t think. It’s just cumbersome wording. You’re right that hit and run occurs after the collision though. Actually this article is spot on. Until it is determined that a collision could not have been avoided, the term accident should not be used. Collision is a statement of fact. Accident is a statement of cause. Being incapacitated by the sun, or even a sneeze, is NO accident. It is the duty of a driver to take due care when operating machinery to prepare for or react to a sneeze or the sun. If you sneeze, slow down and scan for a safe place to execute the sneeze. If the sun blinds you, immediately slow down and proceed with caution. No excuses. Just because something is not intentional, doesn’t mean it needs to be described as “an accident.” When people spill milk, it is unintentional, but we don’t call it an accident, we say they spilled milk. Maybe we say they accidentally spilled milk. The only other instance I can think of where we call something “an accident,” as a noun, is when people soil their pants. These car collisions are legal matters where people’s lives are at stake. While in most cases neither party intended to crash, that doesn’t mean there is no culpability on either side. As far as the media’s concerned, if they’re rushing out the scene of a collision, how can they even be certain it was indeed “an accident” in a literal sense until an investigation has taken place? A not insubstantial number of male traffic fatalities are vehicular suicide. Anyway, we’re not trying to say a lot of crashes are intentional, just that “accident” is a loaded and bad way to describe them. But the majority of collisions are the predictable results of deliberate actions. A driver deliberately drives too fast, or they deliberately play with their phone, or they deliberately try to beat the yellow light, or they deliberately drink and drive. They know that these actions pose an unacceptably high risk of a collision, but they do them anyway. When somebody deliberately does something that’s likely to cause a crash, the result is deliberate, not accidental. I believe “criminal negligence” is the correct term to use. Negligence is not deliberate and intended. Neither is it accidental. It is the result of taking risks with human life. When those risks result in someone’s death it is criminal negligence. Did “but it was an accident!” convince your mom when you were a kid and broke a ceramic lamp because you were throwing a ball in the living room? Never worked for me. This is too much nip-ticking on language, in my opinion. A hit-and-run, efforts to conceal the event etc. are all post-accident occurrences not encompassed by its definition. For instance, one could have a tornado hit his/her insured home, and then, afterwards, make a false claim a non-existent high-end laptop was destroyed to the insurance adjuster. Separate events: tornado hit + false insurance claim. Leaving the scene of an accident can only happen if an accident happened, but isn’t a necessary consequence of an accident. This very lesson illustrates my problem with this stupid debate and the senseless nitpicking over a particular word. Did you mean to break the lamp? No. Was breaking the lamp an accident? Yes. Does the fact that breaking the lamp was an accident absolve you of responsibility? Not at all. “Accident” does not mean “without responsibility or consequence.” Most of us learned this as children. We don’t have to be down on the word “accident” to be up on the word “collision.” The word “accident” is about the intent of one of the parties, where “collision” is clearly a description of what happened. As such “collision” is a better word to use in general, even if everybody agrees that a particular incident is accidental. Those who predictably refer to this discussion as nitpicking are missing the very important point. Describing car crashes using the term “accident”, which has been the standard in our culture for a very long time now, is harmful. It’s indicative of America’s culture surrounding driving. Everyone is given a very generous amount of leeway. It’s accepted that driving “accidents” happen to us all, and are just a part of life. It’s not the point of this discussion that anyone is intentionally crashing their cars into things or people. The point is we need to change the culture toward one in which we hold drivers accountable for their choices and actions. It should not be called an accident when a driver neglects to use their brain behind the wheel. It’s not an accident when a driver engages in the lazy, piss poor behavior that is the accepted norm. It’s not accidental when a driver chooses to act aggressively, rudely or irresponsibly toward other drivers – and especially toward vulnerable road users. Truth is, nit picking is what the AP Style Guide is all about. One of its major functions is to help people standardize abbreviations. Yes, the word “accident” doesn’t mean that there is no notion of fault – only that the incident was not intended. Courts typically attribute a percentage blame when determining damages. A blatant case of gross negligence where the other party is totally blameless would presumably lead to an attribution of 100% blame to that party. But even then, it may not rise to the level of criminal intent..
More common is an attribution of blame between 0% and 100%. I take some people to be saying here that there is always blame for a collision, but I am not so sure. It could be a sudden mechanical failure of the vehicle, for instance (assuming the service schedule was followed). Or if a child runs out into the street the driver must swerve and may hit a third party. Perhaps in that case the parent of the child is to blame? Angie would you mind if we linked to this article from our “About” page? My point is that when people want to be excused for careless behavior will frame it as “an accident” vs the unlucky result of negligence. Although it may not work on a mother who saw evidence of kids playing football in the living room, positioning a collision as an accident can be enough to bias a reader to think “these things just happen” vs our roads aren’t designed for safety or people are not driving with due care. Accident implies “not intentional” Are you trying to say then that all collisions are intentional? And what about accidents where the ped/biker is at fault? We need to change the culture toward one in which we hold *people* accountable for their choices and actions. Collision is not a good substitute. It comes from “collide,” and the AP restricts collide to cases where both objects are moving. Many auto crashes involve one moving and one stationary object. Anyway, if the driver didn’t intend to perform the particular action, then “accident” is the right word. “Intend” would mean *literally* saying, “Now let me just run this car into that wall over there …” or, “That mime is annoying me, and I think I’ll strike him with my automobile.” Driving while eating popcorn with one hand and texting with the other might be a criminal action, but it is not the same as forming those particular thoughts. It’s still an accident. You can go to prison for an accident. It took a few years, but they finally did it. The 2016 Stylebook now suggests that reporters no longer use “accident” is there is negligence or the allegation of negligence. It’s not perfect, but it’s better than nothing.